The Areca Palm is a fast growing native of Madagascar. Its height is variable as it can be container grown to 8-10 feet or grown in the ground in frost free locations to 30 feet. The fronds turn a golden yellow color when exposed to direct sun and produce beautiful, bright yellow berries in August. They are quite fast growing, usually 2 feet or more per year and are a clumping species. They will produce large canes and a beautiful yellow-green crownshafts. Areca Palms will do well indoors in very bright light and will grow in full shade or full sun outside. While they are quite tropical, it is very hard to kill these plants by cold once they are mature. If they do die back, they will usually produce new stakls from their roots. A magnificant palm for any tropical effect. 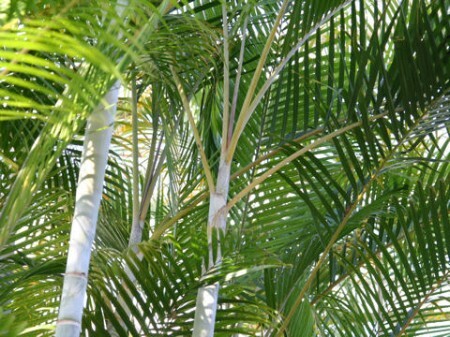 Palm 7-2-7 Fertilizer is best during the warm months. Applications of Copper fungicide may be necessary during humid, warm months.